Versatile Blogger? Tag, You’re It. Thanks Sally Wilde for tagging me. 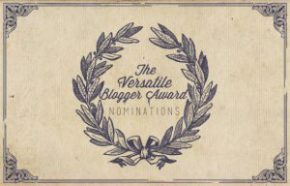 Its been a while since I’ve done one of these and there are lots of good, versatile blogs out there to nominate. Given seven things about myself… hmm, I don’t usually blog about personal things so I guess this is an opportunity to share a little. 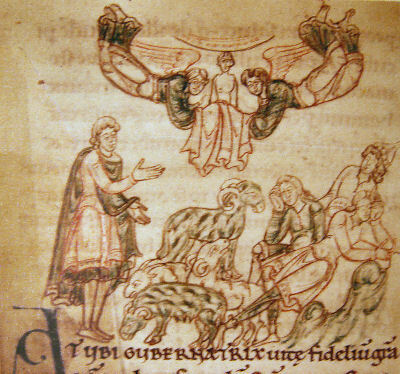 I should start with my three blogs Heavenfield here, Contagions on historic infectious diseases, and Selah on Bede’s abbreviated psalter, development of prayerbooks and modern church stuff. I started the journal The Heroic Age: A Journal of Early Medieval Northwestern Europe in 1998. I’ve long since turned it over to capable hands. My training is in biology and biosecurity; no formal history or literature training. I teach several life science courses online every year, in addition to working in the lab. I also maintain my church’s website and facebook page. As my online activity has diversified, I seem to have less time to blog (and to think about what to blog on). I first got interested in medieval studies from an interest in Arthuriana, but once I found Bede I never really looked back at Arthur again. I’ve focused here on seventh Northumbria and I’m still very interested in it. I’ve pretty much caught up with 7-8 th century history, short of new things that come out. New discoveries on the Plague of Justinian will hopefully eventually give me more topics for Heavenfield. Plague brings together all of my interests: scientific, biosecurity, public health, history. While the science is coming quickly now (discussed mostly on Contagions), I’m sure history’s time will come soon. It would be nice to have a few more plague of Justinian sites confirmed. I’ve lived in the midwestern US my entire life, mid-Mississippi Valley to be more precise. I’ve only been to England-Wales once, Lindisfarne is as close as I’ve ever been to Scotland. 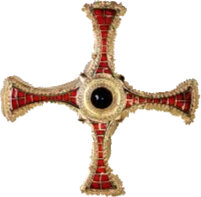 Tim Clarkson of Senchus and Heart of the Kingdom writes about all things early medieval Scotland. Curt Emanuel, the Medieval History Geek, who writes primarily about Late Antiquity. Karen Jolly of Revealing Words who writes about 10th century Northumbria. Derek Olson of Haligweorc writes about Anglican liturgical history and development. Jonathan Jarrett of A Corner of Tenth Century Europe who writes about Catalonia and Oxford academia. Guy Halsall of Historian on the Edge (AKA Professor Grumpy) writes about Late Antiquity and Early Medieval Europe when he isn’t being grumpy about UK academia. Katy Meyer of Bones Don’t Lie who writes about mortuary archaeology. Kristina Killgrove of Powered by Osteons writes about Roman bioarchaeology. Diane McIlmoyle of Esmeralda’s Cumbrian History and Folklore writes about, you guessed it, history and folklore of northwestern England/southwestern Scotland. Later than the rest but for Sally, Lindsey Fitzharris of The Chururgeon’s Apprentice who writes on early modern surgery and medical collections. Thanks for the tag, Michelle! I really must try to follow it up. Great recommendations there. Thanks also for the tag and insights on your conversion from Arthur to Bede. A number of years ago, when we still corresponded on list-serves, a number of medievalists confessed to a childhood attraction to the comic strip Prince Valiant as their entry point into further study. Although I went from literature to history, it was not Arthur but Tolkien and Lewis that drew me in. That, and I much prefer the Dream of the Rood to Beowulf. I may try and get a blog post up in response to this tag, but I don’t know if I can make many nominations other than the ones here…. Thankyou for the link, Michelle, I’m not sure I shall be able to follow up either but the recommendation is always flattering! Thank you very much for the tag. It may be the first such ‘award’ I’ve had and is much appreciated.